This accessible home-brew guide for alcoholic and non-alcoholic fermented drinks, from Apartment Therapy- The Kitchn’s Emma Christensen, offers a wide range of simple yet enticing recipes for Root Beer, Honey Green Tea Kombucha, Pear Cider, Gluten-Free Sorghum Ale, Blueberry-Lavender Mead, Gin Sake, Plum Wine, and more. Making naturally fermented sodas, tending batches of kombucha, and tackling homebrewed beer are the next frontier for the homemade revolution. Food writer Emma Christensen shows that these projects can be all done in the smallest apartment kitchen with little more equipment than a soup pot, a plastic bucket, and a long-handled spoon. 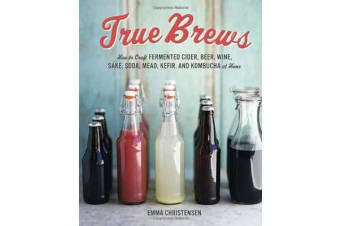 This book captures that crafty, adventurous spirit that makes the brewing arts accessible. Since all 50-plus recipes stem from the same basic technique and use the same simple equipment, it’s easy for cooks to make the leap from project to project. 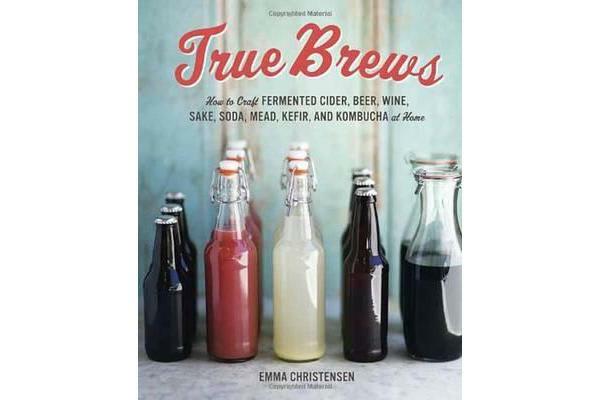 By covering a rage of homemade beverages, from quick and easy kefir to cellared fruit wines, True Brews is sure to be a hit with the DIY crowd.